TamilNet asked whether the issue of the high security zones in Jaffna was discussed at the meeting with the civilian officials in Jaffna. Civil society groups and Sri Lankan government officials in Jaffna argue that the Sri Lanka army garrisons which have displaced thousands of families from their villages, towns and farmlands since 1990 is fundamentally a question about resettling the refugees in their homes as an integral part of the peace process in Sri Lanka. Therefore civilian authorities should have a key role on the question of the HSZs, they say. The Sri Lankan military rejects this position. The press was not allowed to cover the meeting between local civilian officials and the northern peninsula’s new Sri Lankan security forces commander. 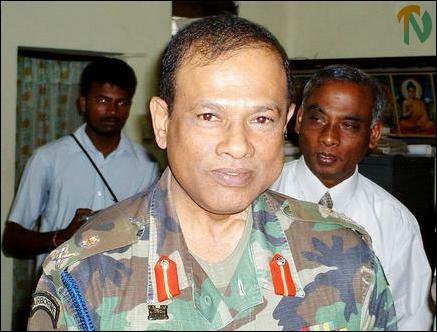 However, at the conclusion of the parley, Maj. Gen. Chandrapala agreed to meet media persons briefly with Mr. S. Pathmanathan, the Government Agent for Jaffna. He urged newspapers in the peninsula not to stir up forces in the south against him by publishing ‘exaggerated reports’ about him. Uthayan, a Jaffna daily, said in its Wednesday edition headline that Maj. Gen. Chandrapala had promised to improve relations between the public and the military in Jaffna. The GA spoke on behalf of the Sri Lanka Jaffna SF commander regarding the gist of the meeting. “We agreed to identify problems, to settle them through discussions and to find solutions through cooperation”, the GA said in the presence of Maj. Gen. Chandrapala. “He (the Jaffna SF commander) has promised me that he would work with commitment to his country and people,” the GA told the press. Meanwhile, Jaffna District Secretariat sources said that the GA and other senior officials took up with the SF commander the problems facing thousands of families that still remain displaced from their villages, towns and farmlands by Sri Lanka army’s sprawling garrisons in Jaffna. The difficulties encountered by contractors who are constructing new buildings for Hartley College in Pt. Pedro which is inside an SLA garrison was also discussed. “The new SF commander is trying out a better public relations strategy. But none of the fundamental positions of the Sri Lanka army regarding the issues bothering the people of Jaffna have changed”, an official who took part in the meeting said.